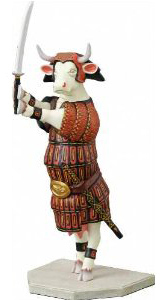 How about some Midnight Moo? I managed to see a new cow during my latest Trader Joe’s visit. I’m sure it’s not a new product but since I don’t buy chocolate syrup, I’ve never noticed it before. I did yesterday though, as a whole bunch of bottles were sitting on an aisle’s end cap. 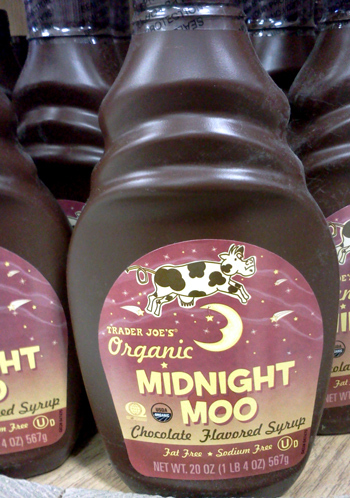 I present you Trader Joe’s organic Midnight Moo chocolate syrup. Doesn’t this make you want to buy some? 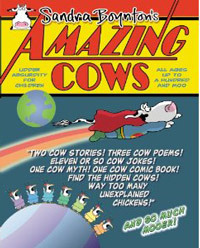 You know you can’t go wrong when the cow is jumping over the moon. I never eat chocolate syrup, Eurggh. I don’t either. I like to make hot chocolate with good quality chocolate powder and I prefer hot fudge on ice cream. I think chocolate syrup is more like syrup and less like chocolate.